July 20, 2018 - TradeTec Computer Systems of Parksville, B.C., a leading solutions partner to the lumber industry since 1986, is committed to providing decision-makers access to the best information possible, in real-time. The TradeTec product development and implementation services team are the largest dedicated team in the industry; and with over 200 years collective experience, the impact of TradeTec solutions become increasingly popular every year. 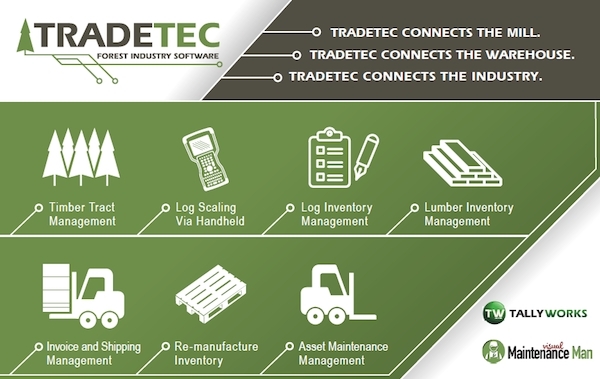 TradeTec is widely known for its TallyWorks and TallyWeb solutions that manage logs and lumber inventory in mills and warehouses; and TradeTec is the only lumber industry partner to have developed a computerized maintenance management solution (CMMS), Visual Maintenance Man (VMM). TradeTec knows their work is important for local and global lumber markets. TradeTec operates in an entrepreneurial mode driven by learning. TradeTec prepares an enterprise to make critical decisions using the best information possible. TradeTec takes action in response to the lumber industry only. TradeTec solutions connects the enterprise in real-time. TradeTec solutions are time-sensitive; and render immediate access to historical and forecasted information that describes critical enterprise functions. The rendering of real-time information from TradeTec solutions impacts the enterprise from the first moment logs are identified through the entire production and distribution process because they represent both disruptive and sustaining innovations. Disruptive innovations are distinguished as those which create a demand for something, which never existed before, and is often a product improvement; whereas a sustaining innovation enhances something already in place, and is often a process improvement. As depicted in the graphic, production and distribution processes are becoming increasingly automated, leveraging a variety of sensors, drives, interface, and controls; and with that, the criticality of interfacing operations technology (OT) and information technology (IT) is also increasingly important. This phenomenon of interfacing OT into the resulting IT, is known also as the Internet-of-Things (IoT) or Internet-of-Everything; and is the inevitable outcome of the fourth Industrial Revolution wherein everything locale and global is being digitized and connected. The technologies necessary to interface OT and IT include both disruptive and sustaining innovations, such as what TradeTec provides the lumber industry. OT refers to hardware and software that monitor and direct tangible units, people and assets. IT refers to information rendered for decision-making functions; and in general, IT does not include embedded technologies that do not generate data for enterprise use. As an OT solution, VMM allows bi-directional human interface into equipment (HMI) that is connected using sensors (temp, RPM, hours, etc.) and automated controls (PLCs). These bi-directional signals over a network of sensors that trigger HMI or PLC controls to engage, is referred to as SCADA, supervisory control and data acquisition. TradeTec VMM is an OT or a SCADA system and is also an IT system wherein information stimulates human involvement beyond HMI in the form of work orders, purchase orders, and learning. While most SCADA allows HMI for bi-directional control of assets, it does not create a traceable stimulus for human engagement such as the function of a work-order. Similarly, in the process of completing a work-order, inventory is relinquished and becomes the stimulus for a purchase-order. This process of maintenance tracked in CMMS (i.e. work-orders and purchase-orders) is accomplished by ongoing learning. Unlike a bi-directional SCADA interface (i.e. OT), VMM is also the information (i.e. IT) that engages the workforce by stimulating accountability measures and human resources development (HRD) through facilitated learning. The IT result of OT for monitor/control assets is the information describing workforce interactions with assets in the past to influence decisions about workforce interactions with assets in the future. Likewise, the IT result of OT HRD/learning is a knowledge base describing a skilled workforce of the past to influence decisions HRD/learning for a skilled workforce in the future. TradeTec plans to stay dedicated exclusively to the lumber industry for the long-term. So, if you are a lumber producing enterprise or a lumber distributor, you can be confident that TradeTec has the product and process innovations you require now and in-the-future. TradeTec is committed to providing your decision makers access of the best information possible, in real-time.